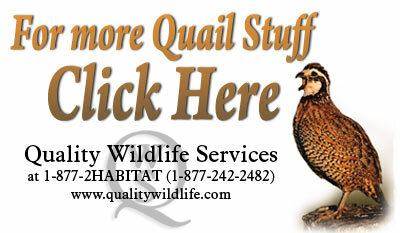 There are many different ways to release quail. Here are a few that I used successfully at my Covey Base Camps. 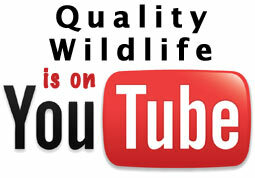 Whenever I am conducting a pre-season release of quail on my hunting area, I try to do it in a gentle fashion. 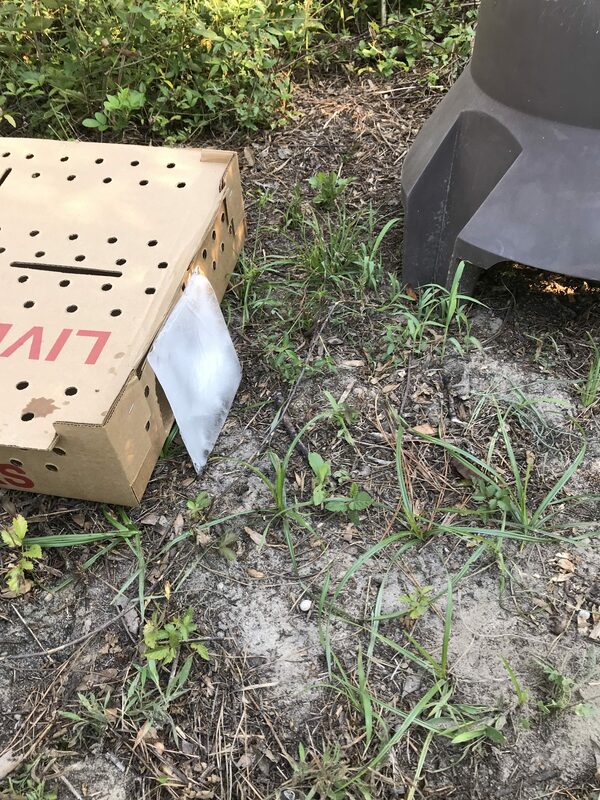 I don’t want the quail to be so excited that they flee the area before they have a chance to find the feed and water I have provided them at the release site. 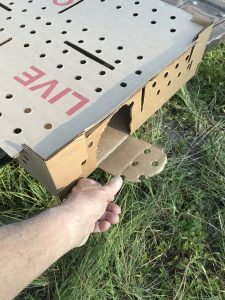 When I first started doing these types of releases, I used take my boxes of quail out to the release sites in the middle of the night. The quail would be very calm because of the darkness. 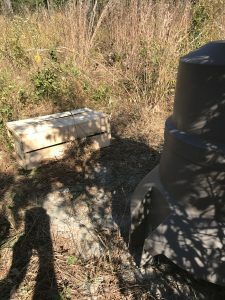 If there were any foxes or bobcats on the prowl, I would run them off as I went to each site. I would start releasing about midnight. I timed this work so that I finished just a couple hours before sunrise. At sunrise the quail would start leaving the boxes on their own through the exit hole I had cut in the end of the box. The birds would then begin getting feed and water from the Base Camp that was there to greet them. This method is practical for smaller projects where you are only releasing a few coveys. If the birds arrive in a card board box, I just cut an arch shape in the box about the width of a quail. 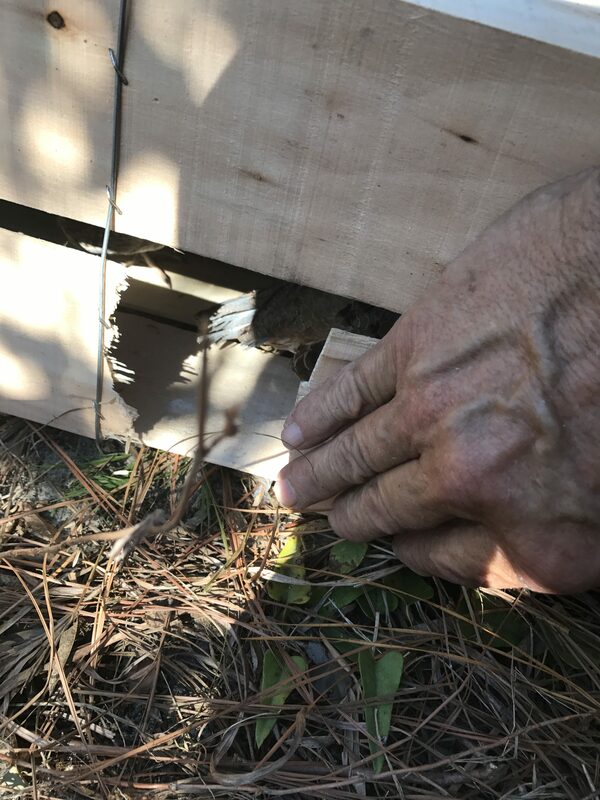 When the box is placed on the ground I just fold the flap under the box and keep my hand over the hole until the box put on the ground. Flap cut in cardboard box. 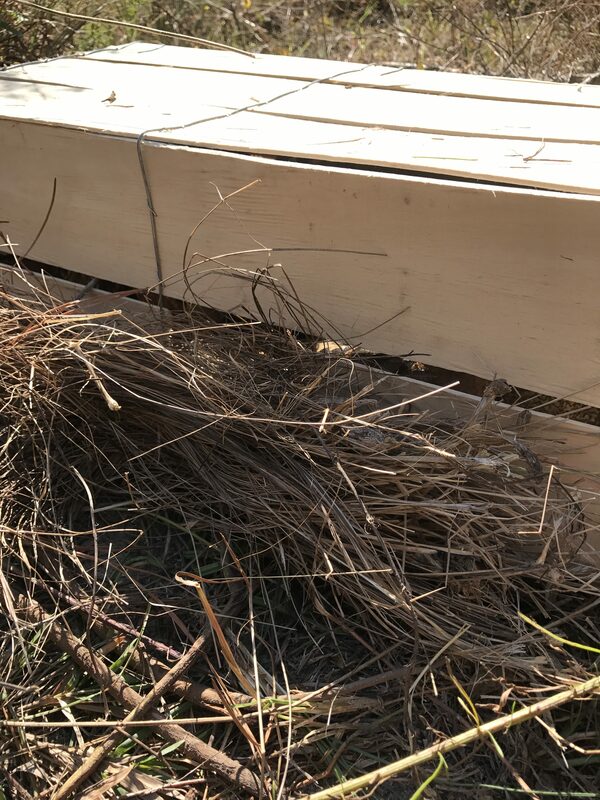 If the birds arrive in a wooden fruit crate, use tin snips to cut through the bottom slat away from the wire binding wide enough for a quail to get through. Then break off the slat against the wire. Break off slat against wire binding. Some of my larger projects required me to establish a hundred or more pre-season release coveys. 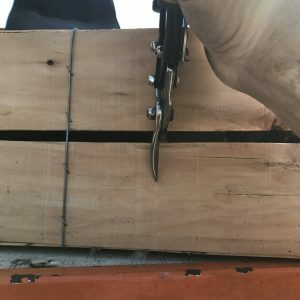 Using ice to block the box exit allowed me to obtain a gentle release during the daylight hours. This is how I did it. Take a one quart freezer ziploc bag and fill it half way with water. Squeeze all the air out of the bag and seal it. Next, lay the sealed bags on a flat cookie sheet and place in the freezer. This will result in creating a square sheet of ice about a half inch thick. When I went out to release my coveys, I just put all these ice packets in my cooler. When I placed a box of quail at the release site, I simply cut an opening in the box, cut open the ziploc bag and remove the sheet of ice and place it over the opening. As the ice melted, the birds eventually saw an opening and exited calmly. Last year I got caught off guard and had to release 40 coveys of quail on a different date than scheduled. Since I didn’t have any ziploc bags of ice prepared, I filled a cooler full of bagged ice from the corner store and headed out to my project. After placing the birds at the release site, I took a feed scoop full of ice from the cooler and piled it up in front of the box opening. This gave me the same results as the ice bag without having to mess with the bags. Sometimes necessity is the mother of a better idea. I had a friend of mine tell me that he just uses a wad of dead grass to delay the release of his coveys. 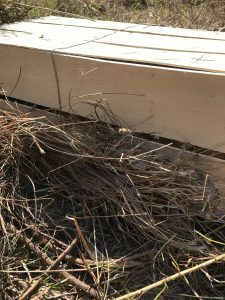 The dead grass is loosely stuck into the exit hole and eventually the birds peak through it and exit the box. Always take weather into account when you are releasing your coveys. When I begin releasing coveys in mid-September , the temps can run in the upper 80’s . 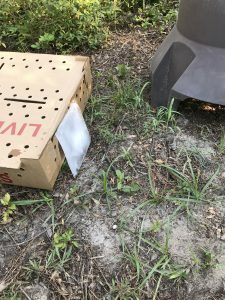 When this is the case, I set the box of quail in the shade at the release site to keep them cool until they find their way out. Birds that are overly heat stressed during transport or while being held can become so physiologically damaged that they will never recover. 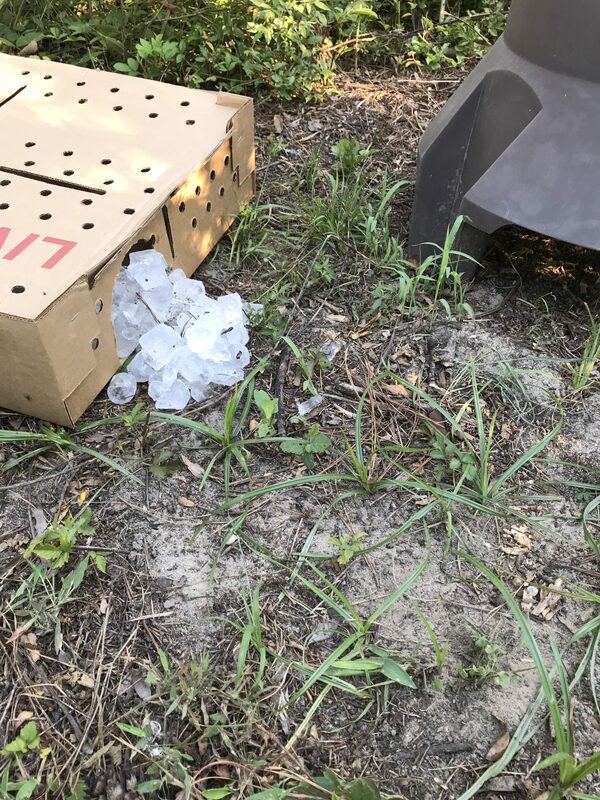 During hot weather I like to use one of the ice methods mentioned because the quail can obtain moisture from the melting ice until they leave the box. Also, ice melts in relatively short time. Coveys released during the cooler weather of October are much easier to transport and hold without being heat stressed. Last year I changed over to using the “dead grass” method then, as the temperatures cooled off. It worked fine. There is no one best way to do covey releases. I hope the methods we have discussed help you choose the one that is best for you in your situation this season.